I clearly remember the frustrating and hopeless feeling I had when I was ill and nobody could help me. Perhaps you feel the same? Perhaps you suffer from one or more health problems with no hope of improvement? Maybe you tried all the conventional and alternative methods with medication, supplements and treatments and it is about to bankrupt you? Perhaps you have even given up on your doctor and worry that it might only get worse? Are you simply stressed out and burned out because you have nowhere to go and you are about to give up? If yes, then you feel exactly the way I did back in 2008. Luckily I learned how the body can heal itself and I have made it my mission to share this with others. When you cut yourself or break an arm your body will heal it. It is not the doctor, nor the medication that does that. Our bodies can heal way more than we think but in our modern society the body is often too busy trying to clean itself after our unhealthy diets and lifestyles to do any serious healing. This changes dramatically when you clean up your diet and lifestyle and if you do it the right way the body will start to detox and repair like you have never seen it before. Over and over again I see people get rid of ailments and diseases that they haven’t been able to eliminate in conventional ways. This sometimes even includes diseases that are normally labelled incurable or chronic. That said it is not a quick fix, and it takes both time and patience if you want to give the natural method a try. You may also have to go through a period of detox but it can truly be worthwhile. So my mission is to teach you how you can remove the things that you body doesn’t want and add the things that it does want so it gets more energy for healing. I’m not a doctor or dietician. I didn’t invent this way of getting well. Nature did! I just learned how to use it efficiently and now I help other people do the same. The first step is to remove the root cause though it can be hard to find sometimes. Your symptoms may give it away and once identified the first step of action is to remove it. This could for example be stress, so if stress is the cause then stress will have to be eliminated before you can get well. By changing your diet to include tons of raw fruits and vegetables you can really speed things up. The diet I use is called the 80/10/10 diet and it is especially rich in fruits and leafy greens. The diet is extremely powerful and you need to know exactly what you are doing or else you may get problems. Get my ‘Get Started Guide’ here if you want to learn more. Certain lifestyle changes within areas like sleep, water, exercise, stimulants, air, sunshine and general wellbeing are vital if you want to get well naturally. Our thoughts and emotions influence our health way more than we think so a change in thoughts and mindset is very important for your health too. It can be hard to know where to start so therefore I have made some material for you. 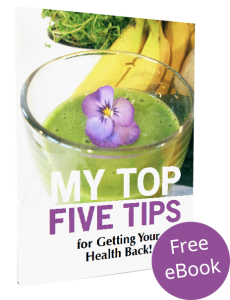 Firstly you can sign up to my newsletter and get my ‘Top 5 Tips for Getting Your Health back Naturally’ totally free. Secondly I recommend you watch my free introduction course where I tell you a lot more about the principles. Get the course here and watch the first video right away. So why not give it a try for perhaps 1-3 months and see if your body starts to repair and detox itself too. If you don’t like it you can always go back to your old ways. Personally I’m super happy that I gave it a try because it literally saved my life. Take my FREE introduction course and learn the basics. It’s my best tips for getting well naturally.